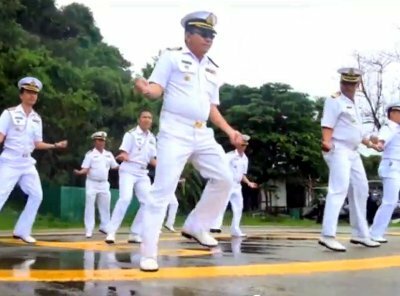 PHUKET: Thai Sailors at the Navy Third Area Command, based at Cape Panwa on Phuket’s east coast, have broken their stoic mold and posted a video on YouTube showing that they can have fun too, by dancing in the now-globally infectious Korean “Gangnam Style”. “The video was created for the farewell party last night for all servicemen and servicewomen to be transferred from Third Naval Area Command to posts elsewhere in Thailand,” explained special reporter Jirayu Naragoonphithak, who assists the Navy base’s public relations staff. “We also wanted to portray a different image of the sailors at the Third Naval Area Command. Every time we appear in the media, we are always shown conducting serious activities and exercises. “This time we wanted to show that we can have fun too,” he said. The video includes all the high-ranking officers at the naval base, including the Commander, Vice Admiral Taratorn Kajitsuwan. “We also did the video because we have the US Navy [warships] coming to Phuket next week. Some US Navy sailors have done a similar video and they have had about 2 million viewers on YouTube. “We are gunning for around 3 million hits,” Mr Jirayu said. The American aircraft carrier USS John C Stennis (CVN-74), dispatched four months ahead of schedule back in August, will arrive in Phuket on October 7 along with two US warships to provide the ships’ 3,500 sailors shore leave. The USS Stennis and her two escorts will put back to sea on October 10.